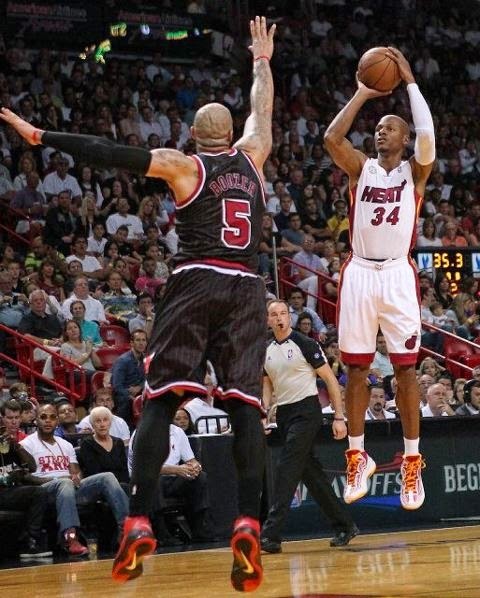 Ray Allen: With age catching up with him, his minutes have dropped as well as his production, but that doesn’t limit the fact that he is one of the best free throw shooters and clutch shot makers still in the game which gives him those late minute opportunities to contribute. His numbers have dipped in just about every category though. He only hit 37.5% from deep which is his worst since the 2009-2010 season. He is now contemplating retirement and if he does, he will be the first UConn Huskies player to be accepted into the Hall of Fame which places him automatically on top of this list. Kemba Walker: Walker took a major step forward with his maturity this past season. He has improved his jump shot and with the addition of Al Jefferson, the Bobcats/Hornets finally found a legitimate low post threat which helps out the spacing on the floor and can create lanes for Walker to drive into. His three point shooting still needs to come up from 33% and he needs to get to the line more, attempting 34 less than the year before. The biggest improvement has been on his ball control. He cut down on the turnovers and has remained steady with the assists and is now hovering around four assists to one turnover. His post season play was memorable, especially after Jefferson went down with an injury. He kept on fighting despite the lopsided scores and showed his major strength which is his heart. Caron Butler: No other UConn Alumni had to go through what Butler had to this prior season. He was traded to the Bucks at the start of the season and was happy to play in front of his home crowd, but the team was dismal and traded him to Oklahoma City Thunder where he had a chance to be a contender for a Championship. While his numbers were pedestrian on the Bucks, once on the Thunders they sky rocketed in just about every category. He once again found himself on a different team though and landed in Detroit where the Pistons have been mired in mediocrity for almost a decade now. Rudy Gay: Rudy still remains an enigma. He has all the tools to be a legit star in this league but hasn’t been able to rise to that next level. He has a silky smooth jumper but it is streaky. He has great ball handling but forces things too much and creates turnovers. He has hops that can rival anyone in the game but settles for jumpers. His defense has always been his Achilles heel and he doesn’t put the same intensity into that end of the court as he does the offensive end. He should be in the prime of his career but he yet again found himself traded from the Raptors to Kings. Where trade rumors are still swirling around him. Andre Drummond: Drummond has improved in each and every season and has become one of the up and coming big men in the game. He has a natural ability to get boards and rebounds and looks to supplant Okafor as UConn’s preeminent double-double guys in the NBA. Jeremy Lamb: Like Rudy Gay, Lamb has a silky smooth game and still has plenty of growth to go. He took a small step forward this year and showed that he could be an important second unit piece but he never showed the consistency to be in the constant rotation come playoff time. Ben Gordon: This has to be one of Gordon’s most disappointing seasons. He was on a team that could use the talents he usually provides, but he just couldn’t find the consistency to break into the second unit. His price tag wasn’t worth his production so Charlotte let him go. It will be interesting to see where he goes after this. He still has plenty of talent left but if he doesn’t find a suitable team, he could be playing overseas. Emeka Okafor: Okafor has been battling injuries for much of the past two years but this one put him on the sideline for much of the season. He’s an expiring contract and will have to make the veteran limit to probably land on a good team looking for depth. Jeff Adrien: Jeff Adrien is that tough nosed and hard working player that teams just like having around, but he has yet to find a team that has shown him some commitment. He played the first half of the season on the Bobcats but found himself shipped off to the Bucks where he played that bruiser inside. He has just inked a one year deal with Houston. A.J. Price: Price has hung onto his NBA dreams with the Timberwolves last season but only played sparingly. It is hard to find veteran point guards and Price has that but his solid playing days are now past him. Hilton Armstrong: Armstrong is a testament to perseverance. He has bounced back and forth from the NBA to overseas to the D-league, but he never gave up and found himself on a Playoff team in Golden State where he was able to make a small enough impact to warrant a second look from teams.